A Lithuanian Cemetery is the first book in the proposed series on Lithuanian culture in the United States. The series is to be published under the general title of Pictorial Encyclopedia of Lithuanian Culture in the USA. The Lithuanian language edition of A Lithuanian Cemetery is entitled Palikę Tėviškės Namus and will be published simultaneously with the English language edition. Other titles in the series projected for 1976-1977 are: (1) Pensylvanijos Angliakasių Lietuva (Lithuanians of the Pennsylvenia Coalmines) by Vladas Būtėnas; (2) Lietuvių šeimos Tradicijos (Lithuanian Family Traditions) by Stasys Yla; (3) Lithuanian Writers in the USA edited by Alina Skrupskelis; (4) Amerikos Lietuvių Muzika, Teatras ir Šokis (Lithuanian American Music, Theater and Dance) edited by prof. Juozas Žilevičius; and (5) Lithuanian Chapter in Multi-Ethnic Chicago (up to World War II) by prof. David Fainhauz. Copies of the first book in the series can be ordered from Lituanus Book Service. It would be possible to divide all the monuments with elements of Lithuanian folk art in St. Casimir into six classes. The monuments are classified according to their most dominant components because, very often, several distinct elements are used for extra ornamentation. The largest group is composed of gravestones with engravings of wooden crosses found in the Lithuanian waysides, villages, and cemeteries. There are those which do not contain any other symbols of our folk art, then there is a wooden cross enclosed in a little fence. Another variation of this type of monument is a carving of a wayside chapel with a ribbon of national weaving design. Worth mentioning here, also, is the drawing of a cross with a chapel which illustrates the "Rūpintojėlis" ("The Worrier"). All of the above-mentioned picture a complete tall cross. 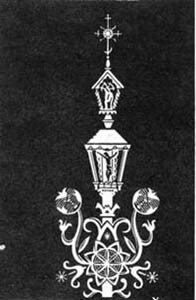 One also finds illustrations of ornamented tops of wooden wayside crosses or other symbols. The details in each of the portraits them or other supplementary elements — a cross top with a stylized Lithuanian cottage, a cross and a sprig of rue. All the portrayals of various forms of Lithuanian folk art crosses, some with much detail, others outlined with only a few strokes, with or without varied additional elements, undoubtedly adorn the greater part of such gravestones. The second largest group of monuments is composed of those containing just the portraits of Our Lady of Vilnius without any additional decorations such as crosses of other symbols. 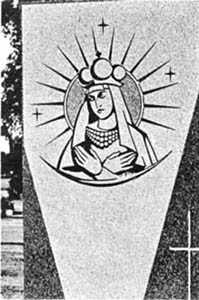 The details in each of the portraits of Our Lady of Vilnius on these grave markers are quite different and are certainly dependent upon the imagination of the monument-maker and his sculpting ability. Here the sculptor does not copy the picture, but instead presents only the larger, more outstanding features. And at the foot of a hero's grassy ancient graveyard." Our Lady of Vilnius. Designed by Ramojus Mozoliauskas. 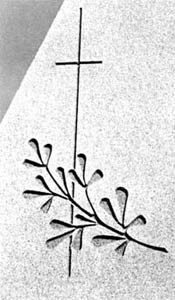 Cross with Sprig of Rue. Designed by Ramojus Mozoliauskas. IV. 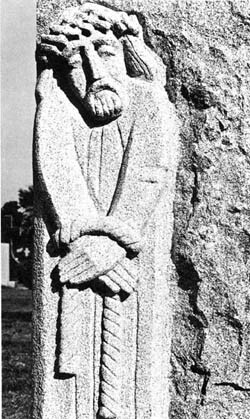 Rūpintojėlis — "The Worrier"
Perhaps the most distinctive in idea and symbolism are the monuments bearing carvings reproduced from the wooden carvings of Rūpintojėlis. These are either direct reproductions or variations, such as a wayside shrine and Rūpintojėlis holding a lamb. Besides those monuments already mentioned which contain designs copied from our folk art, we find individual graves with different symbols, such as a Knight's Cross, an engraved zither (monument to Stepas Sodeika), the shield of the Lithuanian National Guards and others. At some grave-sites, especially those of the new immigrants, one finds rue growing in varied formations, planted from seeds brought from Lithuania. Of all the tombstones mentioned here which bear symbols of our folk art, two are outstanding. 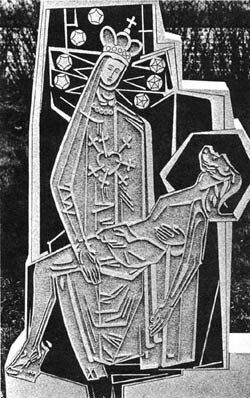 They are those of Daukus, with a wayside shrine sculpture and an engraving of the "Pieta." It is large in format and is in the form of an enlarged, stylized zinc plate which is used for printing graphics. The other is that of Artist P. Augius, with a portrayal (also in the form of a printing plate) of his graphic "Prayer," created in 1937 in Paris, which was purchased by the Vatican Museum. Artists Valius and Daugvila assisted in drafting and designing the monument. The "scenes" on the latter two monuments do not fit within the framework of the monuments' surfaces and thereby are at once distinct from the ordinary flat sandstone, granite or marble slabs, with drawn or engraved scenes and symbols shown in "two-dimensional" designs. 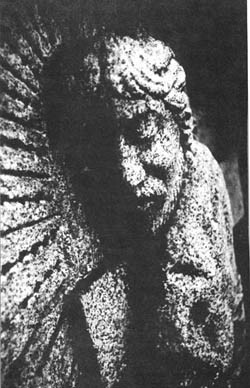 The three-dimensional figurine sculptures projected onto monuments (as much as can be seen at St. Casimir cemetery) are deliberately worked only by Sculptor Ramojus Mozoliauskas. 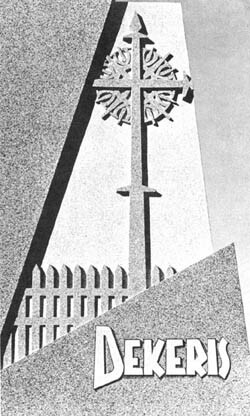 His monument designs, at first, were expressed in two-dimensional drawings: wayside chapel posts, silhouettes of ornamental crosses, basreliefs of Rūpintojėlis (in the Bakaitis-Marcinkus and other tombstones). Now he is becoming increasingly more interested in producing monuments with figurine characters. Two of these should be mentioned: the central one with sculptures, as well as the one in honor of the founders of the cemetery, found at the corner of 111th and Pulaski Road. By their very configurations, composition, and idea, these monuments attract, the attention of every passerby. In Mozoliauskas' projects, however, our folk art plays only a complementary, incidental role. Architect J. Mulokas is also trying to follow the three-dimensional pattern in designing monuments, although in an entirely different manner. Instead of ignoring the folk elements of art, he pays much more attention to them and uses them in his creations. His work is seen in the monument of artist, art historian, and long time Director of the Kaunas Art Academy, Ignas Šlapelis (d. 1955). This is a grey granite block with drawings of St. Casimir and a wayside chapel, topped with a roof of "ponies." 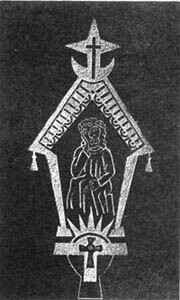 The creation of an ironworker, a stylized metal cross and a sun disk decorated with jagged rays are mounted on top of the stone. The only monument which is altogether distinct is designed by architect J. Mulokas and made by the A. Rudis engineering firm. This monument is for the author J. Ignatonis and V. Meižytė, who died in 1968. 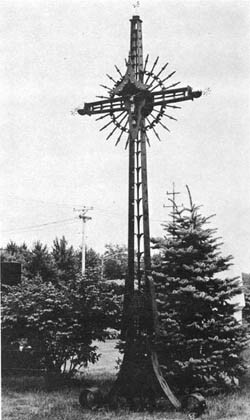 A 20-foot metal cross, an "ironworker's creation," is erected on the ground and is very reminiscent of the stylized crosses topping some church steeples. On the plate bearing biographical data about Ignatonis, there is soldered a replica of the Order of Grand Duke of Gediminas of Lithuania, which was awarded to the deceased in Lithuania. On the reverse side of the cross, the informative data is given in the English language. The construction of this monument took three years and required a special permit for its erection. * Algimantas Kezys, S. J., ed., A Lithuanian Cemetery: St. Casimir Lithuanian Cemetery in Chicago, Illinois. Chicago: Lithuanian Photo Library, 2345 West 56th Street, Chicago, IL 60636 and Loyola University Press, 3441 North Ashland Avenue, Chicago, IL 60657. 246 p. $17.50. Available in December of 1975.